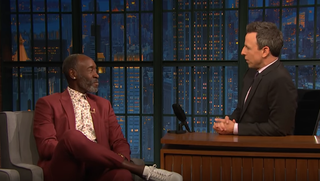 But it’s not all fake cocaine and superhero stripping for Cheadle, as Meyers asked the actor and outspoken activist about the time he met with then Secretary Of State Condoleezza Rice. Referring to a picture of him meeting with Rice in the White House, the Hotel Rwanda star—whose books with John Prendergast about the genocide in Darfur were highly critical of the George W. Bush administration’s lack of response to the crisis—told Meyers that he was summoned after testifying in front of Congress. “It was kind of like getting called into the principal’s office,” Cheadle said, adding that Rice’s message was, essentially, “George Bush can’t stop the genocide in Darfur. You guys need to shut up.” “Oh word? That’s interesting,” deadpanned Cheadle, remembering the incident, before telling Meyers that that story was how he kicked off every book signing from then on.